Visual artist, art historian, and social media and technology innovator Paige Dansinger opened her first solo show with works re-imagining Henri Matisse's odalisque paintings -- with herself as the model. In "Harmony in Red: New Portraits by Paige Dansinger," the artist hopes to reveal the power of femininity and vulnerability. In the early days of French Orientalist Painting, Eugene Delacroix spent 6 months with a Jewish family in Morocco beforehe returned to his Parisian artist's studio and used female Jewish models, who dominated the trade in the 1830-40's, to paint Women of Algiers in their Apartment at the Louvre. Almost 100 years later, Matisse continued the tradition by painting Odalisques influenced by his prior North African visit and was also known for using Jewish models in his studio draped with textiles to create his new Orientalist fantasy. As an artist Paige Dansinger looks for opportunities to recognize her identity within the Diaspora of art history. During the creation of this body of over 20 paintings, Digital Sketchbook, Video, Stickers/Mail Art Drawings, Social Media and Performance that encompass the exhibit, she visited Israel for several weeks, including her son's Bar Mitzvah on Masada. As she transformed Matisse's Reclining Odalisque, or Harmony in Red (1927) from the Met Museum into self portraits their draping became more like talit, or like her Bubbe's old crocheted afghans and the model's bracelets became the bangles she bought in the Old City, the painted textiles and patterns were easily influenced by the many Israeli Moroccan and Yemenite restaurants she frequented. Matisse's model was now a Jewess, painted as an historical femme fatale mixed with 'Queen Esther' qualities. The Odalisques confronts issues of identity, cultural history, class, gender and social-political structures. 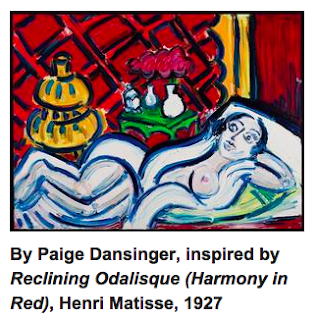 Dansinger reclaimed Matisse's works from the critic's glare and reclaimed the gaze by looking within and sharing her most vulnerable and intimate state and making it a symbol of personal power. The identity of a Jewess is complex, not at all like a decorative motif as Matisse's critics wrote of his works. As companion works to her paintings in Harmony in Red, Dansinger will also display digital pieces she created with #DrawArt, an iPad program she co-developed as a museum engagement tool. #DrawArt is an artist driven projection experience with multi-user mobile companion functions that extend the museum experience with enhanced content and live art video playback. Her oil paintings are rendered by using oil paint directly from the tube, worked into the canvas with her hands as the painting implements, connecting process and performance. This technique of creating work is translated into the #DrawArt program as a similar feeling of organic movement relieves itself in the video playback. See the DrawArt Digital Sketchbook.